The Founding Fathers thought they had done enough with representative democracy. Why would the people vote bums back into office? Yet they do. We do! . Some State Constitutions do permit citizens to draft legislation (Initiation) or put bills that are passed by the legislature on a ballot in the form of referenda or propositions for the people's approval (referendum). Additionally, some states have the power to send them packing. They can send home officials who are not doing their jobs (recall). This is different from but similar to impeachment. Unfortunately, there are no such mechanisms available in the Constitution to permit these notions to operate at the Federal level. More then ever we need these tools to address the weaknesses in our constitutional representative democracy. The above site has been in the process of putting together a constitutional amendment to change our national constitution to permit the people to have a direct voice in the government. With the shenanigans and childlike behavior of our Congress in recent years, especially the corrupt 111th Congress, its time is well overdue. This item is listed above under government reforms. 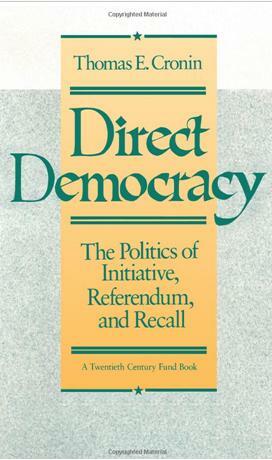 When the Congress is unresponsive, there is a type of democracy called a direct democracy, which uses notions called Initiative, Referendum, and Recall to assure the people have a say in their government even if their Congress chooses not to hear them. It's like having your say even if your representative chooses not to naswer the phone. Here is a better explanation of each. Initiative (also known as a popular or citizen's initiative) - specific type of referenda in which the proposal (including a recall proposal) is placed on the ballot as a result of a petition signed by a certain minimum number of members of the electorate (or of registered voters). In summary, Referendum allows the people to state their opinion on laws that have been enacted by the legislature, and the initiative notion allows the people to propose their own laws. In this manner legislation would be able to be proposed to Congress upon which, they would be compelled to vote. It is time that the people have a mechanism, once a bad legislature, such as the 111th Congress shows up for work. The 112th Congress is better but the Senate seems to be adopting much of the ame ole same ole of the 111th. Using the these three tools the people would have a mechanism to make up for having placed a few bums in power, and they could even throw them out without an election. Besides new blood in the 113th Congress, Initiative Referndum, and Recall would help the people keep government in check for the duration. That kind of power today is needed for the people today.